Graduate engineer Kimberley Middleton has returned to Story Contracting after a six-month secondment at Mott MacDonald in York. Kim, who has been shortlisted in the Graduate of the Year category at this year’s national Construction News Talent Awards, transferred to Mott MacDonald so she could follow a project through its entirety. During her time in York, Kim was involved with the design aspects of an Access for All scheme for Scunthorpe Railway Station which Story will now deliver. “I have helped Mott MacDonald with designing the AfA project and now I can work on it,” said Kim. She added: “I found the secondment challenging but very rewarding. I have definitely increased my technical knowledge and I now have an appreciation of the challenges designers face. Story Contracting didn’t take graduates until Kim, who gained a first in Civil and Structural Engineering (MEng) at the University of Leeds, asked if she could become their first. She had spent two summers with Story on work experience and enjoyed her time so much asked if there was anything the company could offer her and so she worked with Story to develop a programme. “So I was the first graduate at Story. The course I’m on was shaped for me. And now I’m helping to shape it for future graduates,” she said. 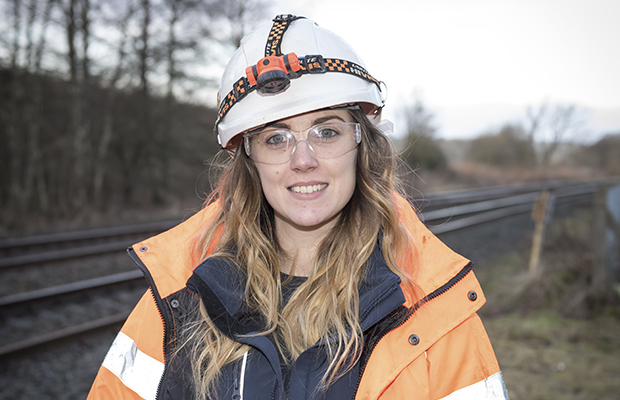 Kim, who was runner-up in the Institution of Civil Engineers’ Emerging Engineers Award in 2017, was heavily involved in Story’s Eden Brows project, which was named Best Small Project (under £25m) at the Rail Partnership Awards 2018. The two-year scheme, delivered on time and budget, saw Story Contracting repair a section of the Settle to Carlisle railway line in Cumbria following a 500,000-tonne landslip. Janet Dunnett, a scheme project manager with Network Rail, met Kim when Story delivered a platform extensions project for them. Story’s Learning and Development department has also been shortlisted for its excellence at the Construction News Talent Awards, which take place in London on Wednesday, November 21. Kim will be up against seven other graduates in her category.